To set up your server to stream MP4 content through the Custom Content section of your admin portal, you will need to set up your Windows Server as a media server capable of streaming MP4s. We recommend using Microsoft’s Internet Information Services (IIS) 7.0 or greater and IIS Media Services 4.0 or greater. Although other streaming software may work, the setup described in this article is the only one officially supported by our team. If you decide to use alternative software, you will need to contact the creator or vendor of that software for any server support needs. You can find Microsoft’s instructions for installing IIS on Windows Server 2008 and Windows Server 2008 R2 here: http://www.iis.net/learn/install/installing-iis-7/installing-iis-7-and-above-on-windows-server-2008-or-windows-server-2008-r2 and the download and instructions for installing IIS Media Services can be found here: http://www.microsoft.com/en-us/download/details.aspx?id=27955. For both IIS and IIS Media Services, the default installation options are sufficient to enable your server to stream MP4 content. You can find more information about IIS and Microsoft’s instructions for installing IIS on Windows Server 2012 here: http://www.iis.net/learn/get-started/whats-new-in-iis-8/installing-iis-8-on-windows-server-2012 and the download and instructions for installing IIS Media Services can be found here: http://www.microsoft.com/en-us/download/details.aspx?id=27955. For both IIS and IIS Media Services, the default installation options are sufficient to enable your server to stream MP4 content. To verify that your MP4 content is working properly, you will need to install a media player capable of playing MP4s. The easiest way to do this is to install Windows Media Player through the Desktop Experience feature in Windows Server 2008 and 2012. You can find more information about the Desktop Experience feature and instructions on how to enable it in Windows Server 2008 here: https://technet.microsoft.com/en-us/library/cc772567.aspx. For Windows Server 2012, you can find more information about the Desktop Experience feature and instructions to enable it using PowerShell here: https://technet.microsoft.com/en-us/library/dn609826.aspx. To enable Desktop Experience using the GUI, you can follow the instructions for Windows Server 2008 but you will have to expand the “User Interfaces and Infrastructure” section in the list of features, as seen here: http://blogs.technet.com/cfs-file.ashx/__key/communityserver-blogs-components-weblogfiles/00-00-00-91-09-metablogapi/2630.image_5F00_614C5A92.png. Once you have successfully enabled Desktop Experience and installed IIS and IIS Media Services, there is a small amount of setup work you will need to do to get your server fully set up. The below instructions and screenshots are from Windows Server 2008 R2, but the process and interface is very similar for Windows Server 2008 and Windows Server 2012. All of the remaining set up work will be done in the IIS Manager. 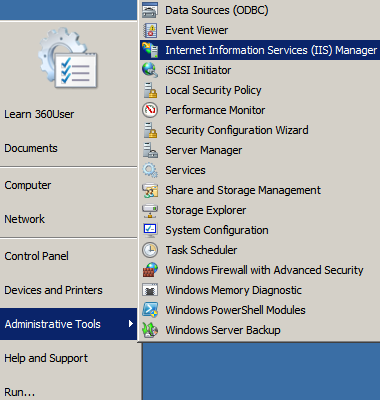 To open the IIS Manager, click on the start menu and go to Administrative Tools and then you will see "Internet Information Services (IIS) Manager" listed there. Once you have opened up IIS Manager, the first step is to rename the default web site (1) that has already been created for you (you can also right-click on the "Sites" folder and select "Add Web Site" but these instructions assume you are going to edit the default web site that already exists - if you add a new web site, you will still need to complete the following steps but IIS Manager will have you do the site setup in the add web site interface). After you have renamed the site you will be using to connect your server, click on your server in the list under "Connections" on the left side of the IIS Manager interface. Next, open up "Directory Browsing" (2) and click the "Enable" button in the Actions menu on the right. After enabling Directory Browsing, you will need to verify that the MP4 MIME type is present in IIS. 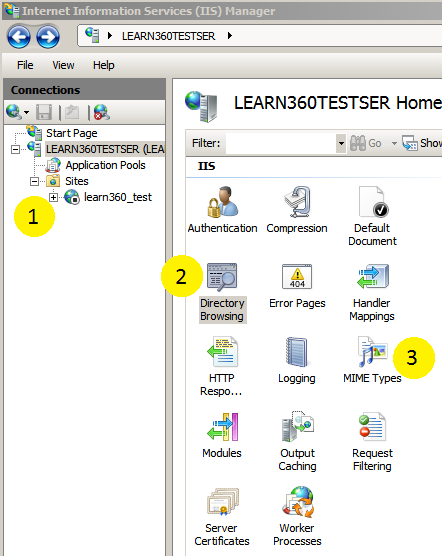 To view the MIME types in IIS, click on your server in the "Connections" list on the left of the interface and then open "MIME Types" (3). Look for MP4 on the list of MIME types, and if it isn't there you will need to add it (it should be there by default in IIS 7.5 and above). When adding it, enter .mp4 as the extension and video/mp4 as the MIME type. Now that we have made the necessary changes to IIS, we will need to finish setting up the site that will be used to connect your server. If you are creating a new site instead of modifying an existing one, IIS Manager will have you do these last few steps during the site creation. The first step involves pointing IIS to the drive or directory where your content will be stored. The location where these folders and files are stored will be referred to as the physical path of the site. Click on "Basic Settings" (1) in the right-hand menu under the "Edit Site" heading. Use the "..." button (2) to browse for and select the correct drive or directory to set the physical path. Click on the "Connect as..." button (3) and enter the server's local administrator credentials. To confirm that the physical path will work correctly, click on the "Test Settings..." button (4). In the window that pops up, every test needs to show a green check mark. If you see any other symbols, those issues will need to be addressed. Under your site on the left side of the IIS Manager, select the directory that contains the video content and then open "HTTP Response Headers" in the center section of the IIS Manager. Be sure not to edit any of the existing settings here. Instead, go to the top right and select "Add" to create a new entry. In the window that pops up, enter "content-disposition" in the Name field and "Attachment" in the Value field and click ok. You should now see the new entry you just created. With your site selected, click on "Bindings..." in the right-hand menu under the "Edit Site" heading. Click "Edit..." (2) with the existing binding selected to open the Edit Site Bindings interface window. If you need further assistance getting your server set up to work with the Custom Content feature, please contact support.